The first things your eye naturally gravitates towards on the label is the calories per serving, serving size and the number of servings per container. This is a good way to know how much you can consume and how many calories you will get. This is helpful on packages that appear to be “single servings” when in reality, if you consume the whole package eat closer to 3 servings. Small packages of nuts often have more than one serving. When the Nutrition Facts Panel is updated in 2018, expect to see to the font size of this part of the panel increase for better viewing. If you want to read the panel today, you may need more carrots and Vitamin A to improve your vision. Ideally, the fats in your diet should be primarily from omega-3 fats (think olive oil, avocado, nuts and nut butters) and limited in omega-6s, saturated and transfats. Pay attention to these key words as they are the ones high in unhealthy fats; partially hydrogenated vegetable oils, shortening, margarine, butter, lard, palm oil, palm kernel oil, safflower, sunflower (unless designated as high oleic) and soybean oil. The ingredient list on a label goes in descending order by weight, so if you can’t completely avoid these, just make sure they are among the last ingredients. 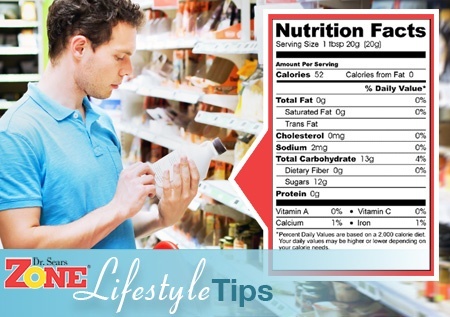 Total carbohydrates on a label includes both fiber and sugar. People often pay attention to total sugars on the label, but that doesn’t tell you if the sugar is naturally occurring or has been added during processing. Natural sugars are those found in fruits (fructose) and dairy (lactose), whereas added sugars are those that have been inserted into a food during processing or preparation. Added sugars and syrups can be found within the ingredient listing and have names like brown sugar, corn syrup, dextrose, high fructose corn syrup, honey, invert sugar, maltose, nectar, raw sugar, sucrose, white granulated sugar. Ideally, added sugars should be less than 10% of your total intake for the day. One 12oz can of regular soda has about 39 grams of added sugar, which equates to approximately 150 calories or about 10 tsp. of sugar. Sweet! Look for added sugars to be a new line item on the updated Nutrition Facts Panel in 2018. Remember, if these fall on the ingredient list, make sure they are listed toward the end of the list, rather than as primary ingredients in your food. The most common misconception of the Zone Diet is that it’s one high in protein, when in actuality, it’s a moderate protein diet. To make things simple, the Zone considers protein as anything that moves – such as chicken, beef or fish. (Well, other than Zone PastaRx, of course). For vegetarians, there are non-meat sources of proteins like beans, soybeans and nuts. We suggest that you aim for about 20-25 grams per meal, which would equate to about 3oz, or about the palm size of your hand. Now that you know which ingredients to look for on the labels, use this knowledge to determine the balance of how these foods fit into your Zone meal. To make your meal Zone-friendly, match every 1 gram of fat, with 2 grams of protein and 3 grams of carbohydrates. The last thing you need is to get labeled as somebody who doesn't know their facts.